On a chilly winter day there's nothing I love more than making soup and my husband's favorite soup just happen to be French Onion, which he loves to order while dining out. The thing is... it's always so salty and probably not the healthiest choice, so I decided to start making my own at home. And well, this soup is now his favorite. Go me. 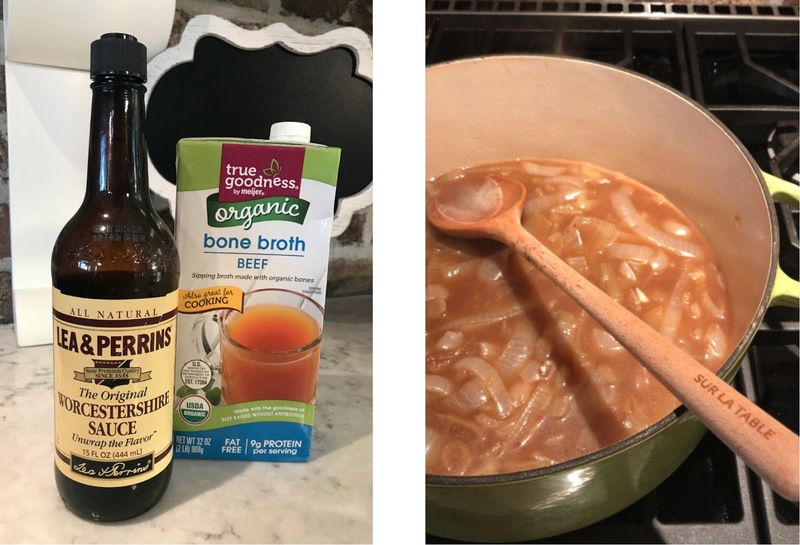 And yes, of course, you can make your own bone broth in advance for this soup and it's wonderful. I love making beef bone broth and even freezing the extras in 16oz containers, but just in case you do not have homemade bone broth on hand this recipe will give you my tried & true shortcut. Yes, I have made it this way and it still tastes amazing! I also do not top my French onion soup with bread or toast either since I'm grain-free, but obviously you could top it with bread and then cheese. The soup ready to cook down. 5. After 30-40 minutes check your onions and stock. The soup should have reduced a bit. At this point do a taste test, add sea salt, if needed. 6. Ladle bowls and top with a slice of Havarti cheese, which will just melt. Note: If you'd like to add a slice of bread to the top of your soup then use an oven safe bowl. Ladle in your soup, add slice of bread and then top with havarti and place in a hot oven for 3-5 minutes to melt cheese. Serve with a side salad for an easy weekend dinner!